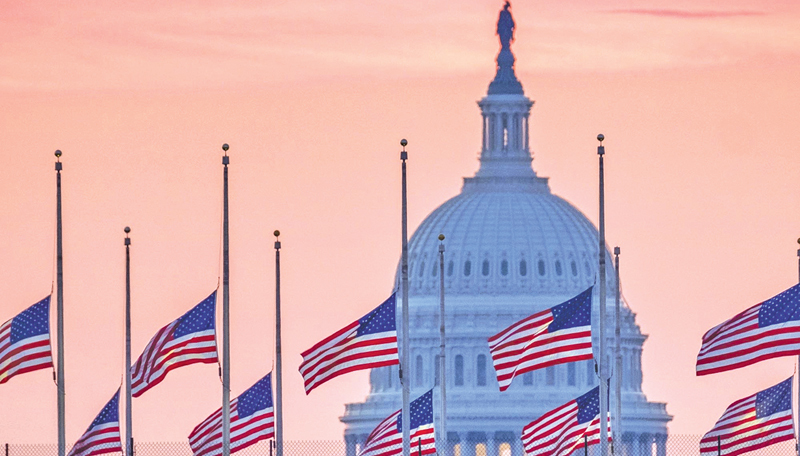 Flags flying at half-staff in honour of Sen. John McCain frame the U.S. Capitol at daybreak in Washington. US: Donald Trump bowed to pressure Monday to honour the late John McCain, ordering that flags be lowered at half-staff across the country, as the late senator fired a parting shot at the President in a farewell message to the United States. Trump’s about-face came after he found himself mired in controversy over his rather conspicuous failure to pay tribute to McCain, who died Saturday at 81 after a year-long battle with brain cancer. When veterans’ groups launched appeals for a more fitting salute to McCain, a Navy veteran who was imprisoned for more than five years in Vietnam, the Republican leader -- who had no love lost for the Arizona senator -- blinked. “Despite our differences on policy and politics, I respect Senator John McCain’s service to our country,” Trump said in a statement as he ordered the flag atop the White House and elsewhere to fly at half-staff until McCain’s burial on Sunday. He later told evangelical leaders that “we very much appreciate everything that senator McCain has done for our country.” The White House flag was lowered after McCain’s death on Saturday -- but it was once again at the top of the flagpole on Monday morning. Trump’s initial silence about McCain underscored the isolation of the US leader and fueled criticism that he is incapable of bringing a divided nation together even as it mourns a man widely seen as an American hero and a political icon. In Phoenix, where a week of tributes to McCain was soon to get under way, the two-time presidential candidate’s former campaign manager Rick Davis confirmed that Trump would not be attending the funeral. However, Vice President Mike Pence is set to speak at a ceremony honoring McCain at the US Capitol on Friday. White House chief of staff John Kelly, Defense Secretary James Mattis and National Security Advisor John Bolton will represent the administration during services. In Phoenix, Davis read a posthumous statement that made a final jab at Trump. “We weaken it when we hide behind walls, rather than tear them down, when we doubt the power of our ideals, rather than trust them to be the great force for change they have always been,” he said -- -- an apparent reference to Trump’s plans for a border wall. The Washington Post reported that White House spokeswoman Sarah Sanders, Chief of Staff Kelly and other senior staff had urged a statement be released referring to McCain as a “hero” -- but Trump opted for a terse, impersonal tweet instead. During the 2016 campaign, Trump mocked McCain’s war service. In the years since, McCain was Trump’s loudest Republican critic, especially as the president disrupted America’s long-time alliances. McCain’s remains will lie in state at Arizona’s capitol on Wednesday, before a public viewing Friday in the rotunda of the US Capitol -- an honour reserved for the likes of John F. Kennedy, Ronald Reagan and civil rights champion Rosa Parks. Among the pallbearers will be Democratic former Vice President Joe Biden, ex-senator Russ Feingold, former New York mayor Michael Bloomberg and actor Warren Beatty. 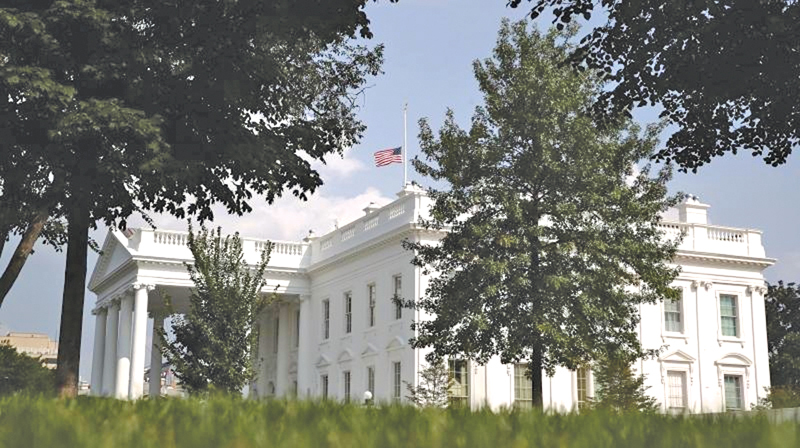 The White House flag was lowered after McCain’s death.